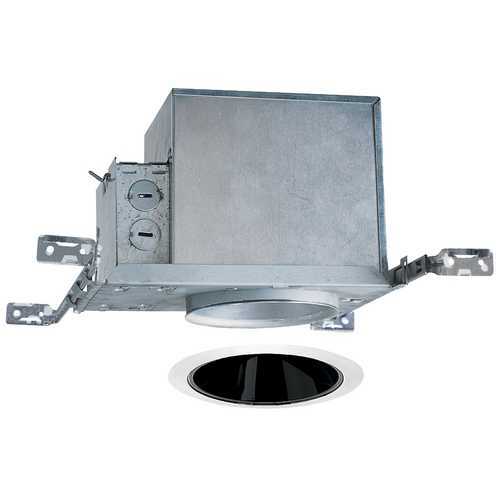 The following are detailed specifications about the 4-inch Recessed Lighting Kit with Black Trim. This recessed lighting kit features a 4-inch insulation-ready housing and a black Alzak cone trim with white trim ring. The fixture is approved for use in wet locations. The housing can be completely covered with insulation. It is air-tight which reduces heating and cooling costs. The hangers are expandable up to 25 inches. Alzak is an anodized, hand-polished aluminum reflector with superior glare reduction. Takes (1) 50-watt halogen PAR30 bulb(s). Bulb(s) sold separately. Damp location rated. UL listed. This 4-inch Recessed Lighting Kit with Black Trim is part of the $item.xCollectionName Collection from Juno Lighting Group. The following items are also part of the $item.xCollectionName Collection.